The Story of "Owl Hijinx"
This automata is inspired by a Gary Larsen cartoon of two owls sitting on a tree branch. 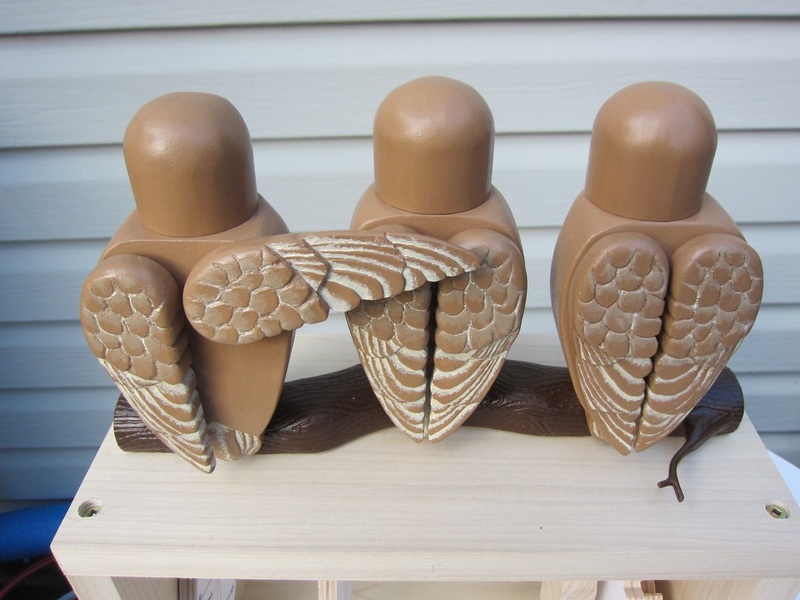 These three Northern Stooge Owls, rarely seen even in the wilds of Ontario, are up to their normal mischievous ways. The first owl sneakily taps the second on the shoulder. The second turns and seeing no one there, quickly accuses the owl on the right, who denies any involvement on his part. Curly, Larry, and Moe, as they came to be called during construction, seem content to play this ruse over and over again not unlike the original Three Stooges! The piece is 15" (38.1 cm) long, 8" (20.3 cm) deep, and 16" (40.6 cm) tall. It weighs 6 ins, (2.7 kg). A collection of a few photos of Curly, Larry and Moe and their roost from the construction and completion of "Owl Hijinx"